2. 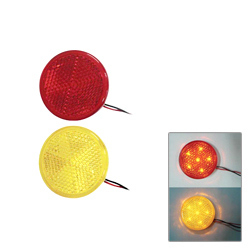 Red or yellow LED x 6 per unit. 3. Function: reflector, tail light & stop light. 3. 3 function in one: reflector (LED off), stop (LED in full brightness) & tail (LED in half brightness). Universal type needs to drill a hole for wires. And use enclosed self-adhesive tape to stick lights on bumper. Installing method: 1. Remove original bumper reflectors. 2. Connect wires as following: 3. Test functions by of tail light and brake light. 4. Fit bumper light into bumper.